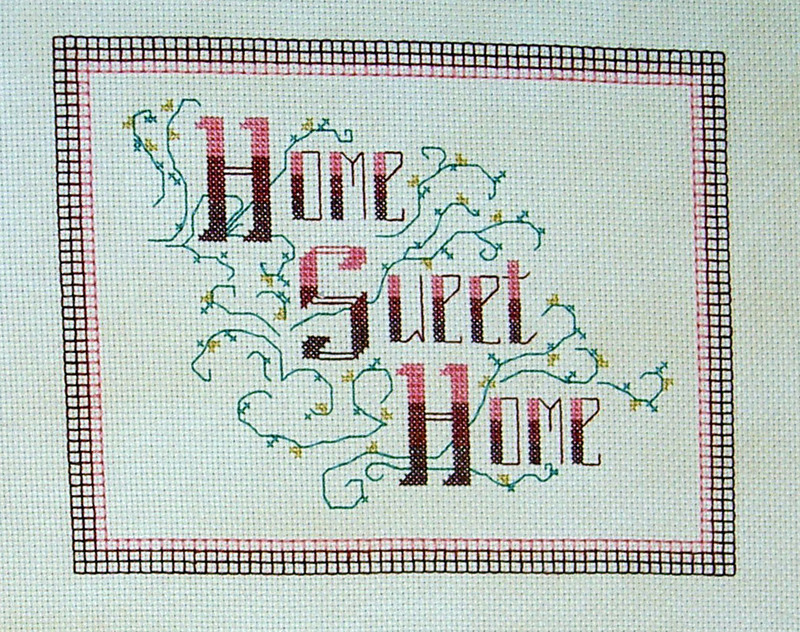 I used foam core board for the first time to frame my Home Sweet Home sampler. First I had fun distressing and glazing the frame, which I found in the thrift store. It started out as glossy white. I bought a big panel (32" x 40") of foam core board at our local frame shop for under $7. This board is made in 3 layers: card stock, foam, card stock. It needs to be cut with a sharp utility knife in 3 passes, cutting one layer at a time. I cut the board a little smaller than frame opening, so there would be room for the aida cloth. The fabric can be centered quite easily and fastened in place by pushing stainless steel dressmaker pins in place along the side of the foam board, as I pictured. The pins stay in too. The next step is to miter the fabric on the back, by folding the excess Aida cloth and stitching the sides together. I stitched the corners together in two steps: starting at the outside and then finishing the inside after I laced the sides together. Some people skip the lacing altogether, as the pins hold the cloth very securely. After that, you are ready to pop the fabric covered board right in the frame and proceed to display. I don't like to use glass with needlework, but that's just me. By the way, the charts for this project came from one of the Spirit of Christmas books that Leisure Arts published every year from 1987 to 2006. I found it in Book 3 from 1989. The isbn is 0942237048 if you want to locate the book.